Now Japan dominates the TV news. This time last year it was the Chilean quake and ProTV did a rather good campaign about how well prepared the Chileans were for their quake. In Chile the people who invest in a building are forever responsible for its structural integrity, whereas in Romania scores of people (in other words nobody) are responsible for construction standards. Nothing came of this and building standards in this country remain overly complex and completely unenforced, and nobody knows if the buildings that have gone up in the last 20 years will withstand the next big quake. But Romanians are an intelligent people and they are aware of two key facts: a devastating earthquake is expected in Bucharest sometime soon; and the authorities have proven time and again that they cannot be relied on to prepare the capital for a quake. Not only are the government authorities unable to consolidate the buildings that are known to be at high risk but they can’t even deal with the much simpler task of informing people about what they can personally do to prepare. All they can do is blame each other, complain about the legislation and wait for the media storm to move on. If you know disaster is coming and your government can’t help, what can you do? If you want to escape from the typical Romanian habit of blame, complacency and fatalism, the only answer is to take personal responsibility and make your own emergency plan. This is easier than it sounds, especially for those Romanians who have created successful businesses – in spite of a government that interferes, over-taxes, demands bribes and generally gets in the way of progress. Disaster preparedness is taken seriously in countries like Japan, Chile, Greece and America and there are plenty of simple things that ordinary people, companies and residents associations can do. If you look at the site of the American Red Cross (who say “the 3 steps to preparedness are: Get a kit. Make a plan. Be informed.”), you will see that a plan doesn’t have to be of the EU or ex-Communist variety commonly used in Romania – long and complex documents that are only understood by the eggheads who write them. A typical American emergency plan is short (it can be pinned onto the kitchen wall) and so clear that even the children understand it. The best way to prepare for an earthquake is to make a plan and the best place to start this process is to make an emergency plan for your family. But you need to start from the premise that everyone involved needs to be involved in the process, understand it, agree with it, be motivated by it and in the event of an emergency everyone (even the youngest children) know what to do. Any experience of planning in the Romanian-Communist-EU way should be thrown out of the window and a much more simple approach must be adopted. You can constantly test if your plan is coherent by simply asking the children, or your Granny, “is it clear”? You don’t need any highly paid experts to develop your own plan; you can do it yourself on the kitchen table. And you should. It might make the difference between life and death. The start of any planning process involves an analysis. 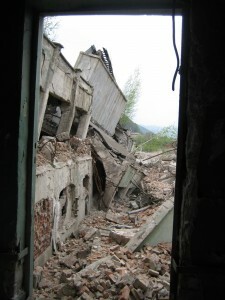 This should be a process of simply learning more about the problem you are addressing – earthquakes, fire and flood – and it is essential to avoid the Romanian institutional trap of including far too many pages of complex research findings in the final plan, often at the start of the document (making it unreadable). But if you take your family as the target audience you will quickly realize the need for only brief, relevant information that everyone understands. You should start by asking questions: what is the likelihood of a big earthquake in Bucharest? What happens to homes in an earthquake? What do we do during the quake? How do we need to prepare psychologically? What will we eat, drink? How will we keep warm after the event? How will we communicate, cook food, move? What do we need to stock up with? And what about floods, fires and other disasters? If you can work out a list of questions like this, and answer them in the family, you will have the basis for a good plan. To make an effective plan you need to make sure that everyone who will be affected by it is involved from the start. If you tell your family or work colleagues “we’ve worked out this new plan and you have to implement it” you can be sure they will not be interested, and why should they if they weren’t involved in its development? It’s important to get people involved at the very beginning of the process – at the concept stage – so that everyone understands the importance of the exercise and has the opportunity to help create it. The starting point should be a simple meeting to discuss earthquakes with the question “what can we do to prepare?” The challenge is to follow this up and to make sure that your group is consulted at every step of the way. If you can do this you will have an action plan in which everyone knows what they have to do in the event of a crisis. If you have a family plan it can be integrated with the plan of the block, the school, the district, the city and even the country – but that is not feasible in a dysfunctional country like Romania. All you can do is look out for your nearest and dearest. What makes a plan effective is practice. The Americans talk about “practicing the plan” and cities in the USA have massive exercises when the emergency services come together with the local companies, as well as civil society, and they practice the routines that are outlined in the plan. The Japanese, Greeks, Israelis and Chileans all practice their plans and when disaster strikes they have remarkably low casualties (remember how many people died in Haiti as compared to Japan?) Needless to say, there is no practicing of Romanian plans – if only because they are so complex and unpractical that practicing them would be impossible. The best plans are those which you develop yourself. Although you can download emergency plan formats from America it’s best to just sit round the kitchen table and ask “what should we do in the event of an emergency?” But most emergency preparedness plans include the following elements: emergency roles for everyone involved; stocks of food, water; torches and bedding; an escape plan (how to get out of town); some form of communication when the phone networks are down (which they always do); a radio; and addressing security issues. I’ve been living in Bucharest for over 10 years and I wish I could tell you I have a well worked out plan that I regularly practise with my wife and two children (aged 8 and 11). But I can’t. Even though I worked on a World Bank funded communication plan for the General Inspectorate for Emergency Situations (a good plan that has been gathering dust ever since), and I know more about it than most people, I haven’t done what I’m telling you to do and I know this is hypocritical. I could easily blame the general Romanian culture of complacency, or a lack of funds, or find all sorts of excuses, but I realize that what was missing all this time is leadership. I should have taken charge of the situation in my own family and sat down with my lovely family and made a plan for their survival – and hopefully I will in the next few days. AAs a survivor of the 1977 earthquake I can tell you one thing: you can do nothing to save yourself or your family in case of a major earthquake. Everything is down to God or chance for atheists. Most dangerous situation happens when the earthquake finds you in building (and that is where you are at night). But even on a street you can be killed by falling bricks if you are stupid enough to get close to a building when the earthquake starts. The only thing that can save if you is to run in the middle of a street, if you are lucky enough to find yourself on a street when a major earthquake starts. That saved my life and my sister’s on 4th March 1977 in Bucharest, when many people died of falling bricks on the streets. Don’t delude yourself that your emergency plans can save you during a major catastrophe, especially an earthquake. I respect the experience of Dacia Felix and his 1977 experience and he may well be right about being powerless in the face of a major earthquake, but if you compare the number of deaths in the Haiti earthquake, where building standards are non-existent, and Chile where they are high, you will see that a good construction code can make all the difference between life and mass death. But a construction code requires good government, not one that can be easily corrupted by building companies. ALso, this fatalistic attitude does nothing to mobilise local families, organisations, local and central government bodies, as they can use it to flop back into complacency. Also, one of the most relevant things about planning for an earthquake is what you can do after the event: if you have a decent food and water supply you will find the following weeks of chaos a lot easier to cope with; if you have sleeping bags nights will be bearable; if you have a radio and batteries you will be able to keep track of the news. So he is wrong to dismiss emergency plans as irrelevant. You are absolutely right regarding the US. Even Hamden, our little town of 45,000,situated about 10 miles north of the Long Island sound has an emergency plan. Go closer to Westport, Stamford, Greenwich and you see evacuation routes posted clearly, and with detailed maps. But please understand that Romanians are different, maybe fatalist. How else can you explain the fact that people still live in those apartment building with “bulina rosie”? That motto ” merge si asa” makes me cringe, after living in the US for 43 years. Or “las’ ca vedem noi atunci”. Do you know the phrase” din ce ti-e dat, nu scapi” – you cannot escape our fate so, why bother. Some kind of “sauve quit peut” mentality but ultimately, “toti isi dau cu parerea” and nothing is being done; their loud apathy is astounding but not for me. I am touched that you (SJ) have such faith in those glass buildings in downtown Bucharest. I’m sure that they are earthquake proof — in theory — but knowing how corrupt building control is in Romania I really doubt they were built properly as all that stuff is expensive. What worries me about those buildings is that the glass front would surely just pop off if shaken from side to side, turning the street below into a graveyard. I too agree with Dacia Felix that we’re in the hands of the Gods. Dear Sair Jay, I do hope your right and that these buildings are as you say. I too have met foreign builders saying how safe they are and I’m sure they are — on the drawing board — but Romania is a corrupt place and builders are expert at cutting corners. Also, they’re under terrible financial pressure to cut costs so if they can do so by ignoring the regs. After all, once you’ve covered up a building who’s to know what’s in the structure. Rolfe Murray, am I sick of this Romania is corrupt, and therefore builders cannot be trusted, bla, bla, bla etc. Builders cutting corners are present everywhere, even in not-corrupt South Korea where a big shopping mall fell down out of blue for exactly this reason. Buildings built in Romania between 1900 and 1989 are deemed safe because the communists learned their lesson about the earthquake. Look at the not-corrupt Japon. Ageing Fukushima nuclear should have been closed some time ago because but got a new licence for 10 years instead. Oh, no, Japan is not a corrupt state like Romania, right? Dear Mr Felix, if you read my comment again I said “builders are expert at cutting corners” and only a fool would say that Romania is the only (or the most) corrupt country. But what I do know is that building control, ie the state checking on construction standards carried out by the builders is not taken seriously in Romania and so if the builder wants to cut corners he can. In my country, Scotland, where I worked in the building trade way back, you can’t. The local building inspector was the scourge of our building site and the boss lived in fear of him as he would tell him to rip down walls and pull up floors if he hadn’t seen the pipes go in first. There was no question of bribery or going above his head as this man had total power over our site. I can’t comment on Japan or South Korea but Romania compares unfavourably to Scotland in this regard. Dacia is right when he says the corruption is everywhere but the architectural mafia in Bucharest (CTUAT and City Hall) are nothing more than bandits… That much has been proven over and over again. But that’s another topic for discussion. Dear Sair Jay, now you seem to have come across the truth…all my instincts and experience tell me that none of the post 1989 buildings can be relied on. I have been involved in renovation work in Romania and I know that the building inspectors are interested in one things only — getting bribes. There are very few of them and they only leave their office when someone complains and when they arrive on site they threaten the owners with all sorts of legal consequences, each one of which comes with a price. You can avoid bribery by simply following the rules, as we did when renovating our attic, but in big jobs where budgets come under pressure the cost of bribing officials is way lower than doing it right. Dacia Felix is surely right that we’re in the laps of the Gods.